NEW ORLEANS – Colorado’s men and Arizona’s women have emerged from the most crucial week of the regular season as the new No. 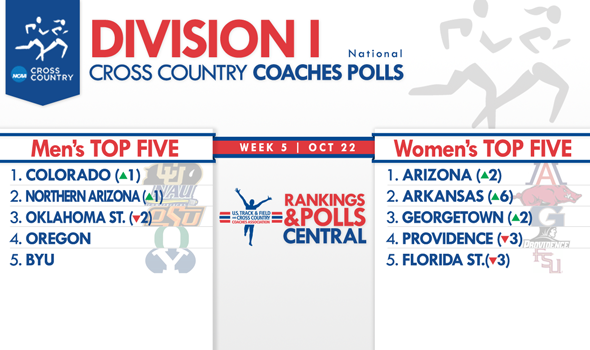 1 teams in the week five U.S. Track & Field and Cross Country Coaches Association (USTFCCCA) Division I National Coaches Polls, released Tuesday. Now that the dust has settled from this past weekend’s Pre-National Invitational and Wisconsin adidas Invitational meets the Pac-12 now controls both of the polls’ top spots, while a total of only four teams between the men’s and women’s polls remained stationary in their positions from the most recent edition. Among those teams that moved are the two former No. 1 teams: Oklahoma State’s defending champion men were among the few squads in the country to not run their "A" team and fell to No. 3, while Providence’s women were done in by their lack of a strong No. 5 runner to drop to No. 4. With Colorado and Arizona both representing the Pac-12 at No. 1 in their respective polls, the duo is the first pair of simultaneous No. 1 teams from the same conference since Stanford’s men and Washington’s women capped off a 23-week stretch of Pac-12 teams holding the polls’ top spots in week seven of the 2009 season. From early 2007 through 2009, the Pac-12 held the top spots in the following combinations: Oregon men/Stanford women (2007); Oregon men/Oregon women (2008 preseason); Oregon men/Washington women (rest of 2008); and Stanford men/Washington women (2009). Colorado is the new top dog in the polls after heading a field of eight other ranked teams at the Pre-National Invitational, garnering six first-place votes of 12 total. Behind two top-10 finishers in seventh-place sophomore Morgan Pearson and ninth-place freshman Ben Saarel in his CU debut, Colorado put its entire scoring lineup within the meet’s top 28 finishers and scored 90 points to runner-up No. 4 Oregon’s 113. The Buffaloes are ranked No. 1 for the first time since the preseason of the 2002 season. CU won national titles in both 2004 and 2006, but were not the top-ranked team in either season. This is the third year in a row the Buffaloes have won the Pre-National team title, but they have finished third in each of the past two NCAA Championships. Teams who claimed the No. 1 rank after winning Pre-Nationals haven’t been successful at the NCAA level as of late, with the Stanford men in 2009 and 2010 retaining their No. 1 rank but finishing 10th and fourth, respectively, at NCAAs. The victors at the day’s other big meet in Wisconsin, Northern Arizona moved up a spot to No. 2 after a dominant meet in Madison. Sixth-place finisher sophomore Futsum Zienasellassie led six Lumberjacks within the top 49 finishers for a team score of 121, well clear of runner-up No. 5 BYU with 174 and the rest of the field featuring 20 ranked teams. Only one other team at Wisconsin turned in as many as four top-50 finishers: No. 10 Columbia, which dropped two spots from its previous position in the poll. Displaced by Colorado and NAU was Oklahoma State, which fell two spots to No. 3. The Cowboys did not run their "A" squad at Pre-Nationals, but their second squad was still able to finish seventh overall, ahead of three teams in this week’s poll. This is a reversal or sorts for the Cowboys, as OSU gained control of the No. 1 spot last season in the week five poll en route to a national title. The last time the Cowboys were ranked No. 3 was — take one guess — week five of the 2009 season, a season that resulted in the program’s first NCAA cross country title. The aforementioned No. 4 Oregon and No. 5 BYU squads were the lone men’s squads to remain stationary in the rankings. The Ducks were runner-up to Colorado in the Blue race at Pre-Nats behind a fourth-place finish by first-year phenom Edward Cheserek and two other finishers in the top 16. French steeplechase transfer junior Tanguy Pepiot was the victor in the open race in his Oregon debut. BYU was the runner-up at Wisconsin behind senior Jason Witt’s eighth-place finish and two other top-27 finishers. The Cougars were the only squad in Madison to place its top seven runners within the top 100 finishers, with seven through in the top 77. Portland moved up one spot to No. 6 following a third-place team finish at Wisconsin with a team score of 216. Wisconsin was among the biggest gainers in the rankings, jumping 13 spots to No. 7 — coincidentally, the Badgers’ preseason rank — following a fourth-place showing at its home meet, just one point behind No. 6 Portland with 217. Two other big gainers joined the top 10 this week in No. 8 Iona, up 10 spots from last time, and No. 9 New Mexico, up 16 spots. Iona was the third-place team finisher at Pre-Nats just 13 points behind No. 4 Oregon and the Gaels were the only team to put seven runners within the top 100 finishers, needing only 80 spots to do so. New Mexico was the fifth team at Wisconsin, boosting the Lobos to their highest rank since they were No 5 heading into the 2010 NCAA Championships. New Mexico is the top-ranked of four Mountain West teams, marking the first time the conference has placed a quartet within the poll. The others are No. 20 Boise State, No. 22 Colorado State and No. 28 Air Force. Dropping out of the top 10 were No. 11 Tulsa (down two spots), No. 12 Arkansas (down six spots) and No. 15 Princeton (down five spots). Among other significant upward movements in the poll was a 16-position increase for No. 13 Stanford, which featured the strongest top-three at Pre-Nationals behind freshman Sean McGorty (fifth), senior Erik Olson (13th) and junior Jim Rosa (14th). No. 16 Michigan also returned to the poll following a week of receiving votes. Making big moves in the other direction were No. 24 Indiana, down 12 spots, and No. 29 Texas, down 15 spots. Joining the poll this week were No. 21 Harvard behind two top-10 finishers at Wisconsin; No. 25 Washington; No. 27 Oklahoma; No. 28 Air Force and No. 30 Southern Utah. Harvard is ranked for the first time since USTFCCCA records began in 1998. The Crimson’s highest finish at the NCAA Championships was ninth in 1968, and their last NCAA appearance came in 1979. Washington is in the poll for the first time since week five of the 2009 season, while Southern Utah is ranked for the first time since the 2000 preseason. Arizona is the new No. 1 in the women’s polls after defeating former No. 1 Providence head-to-head at the Wisconsin adidas Invitational. The Wildcats, led by seventh-place finisher sophomore Kayla Beattie, put four runners among the top 21 finishers en route to a 117 team score, edging out new No. 2 Arkansas’ 136 points and No. 4 Providence’s 191 in a field with 17 ranked teams. This marks the first time the Wildcats have been ranked No. 1 since the beginning of USTFCCCA records in 1995, with the previous best coming last year with a No. 2 rank in week four. The best NCAA Championships finish ever recorded by Arizona’s women came back in 1980 when the Wildcats were runners-up. Finishing runner-up to Arizona at Wisconsin was No. 2 Arkansas, which is No. 2 for the first time since week six of the 2006 season. The Razorbacks were the deepest team at Wisconsin, placing seven runners within the top 78 finishers led by sixth-place finisher junior Grace Heymsfield and eighth-place junior Shannon Klenke. No other team put seven within the top 100, the closest being No. 17 San Francisco needing 103 spots. The Razorbacks were also one of the most top-heavy teams with two top-10 finishers in Heymsfield and Klenke. Only third-place No. 4 Providence placed multiple runners within the top 10 with three. The final first-place vote went to No. 3 Georgetown, the Pre-Nationals team champion. The 2011 national champion Hoyas were the only team to put six runners across the line within the meet’s top 50 finishers, led by 14-th place sophomore Samantha Nadel and 18th-place junior Katrina Coogan. Georgetown may not have had any top-10 finishers, but it did have the tightest scoring lineup at the meet with its top five separated by just 18 places. Providence fell to No. 4 following its third-place showing at Wisconsin. The Friars’ dynamic trio of senior Emily Sisson, sophomore Sarah Collins and senior Laura Nagel was as potent as ever, finishing runner-up, fifth and ninth, respectively. No. 4 runner freshman Catarina Rocha was the second-best No. 4 scorer in the meet at 37th giving the Friars’ the best 1-4 score, but Providence’s No. 5 came across in 138th place — the lowest of the meets’ top 13 teams. Florida State finished runner-up at the Pre-National meet to drop from No. 2 to No. 5 — the lowest rank for FSU since week three of the 2011 season. Top runners junior Colleen Quigley and junior Hannah Walker finished fifth and sixth, respectively, but the rest of FSU’s scoring lineup finished outside the top 30 with its No. 5 coming through in 74th place for a team score of 162 to No. 3 Georgetown’s 117. The runner-up finish broke FSU’s streak of three consecutive Pre-National team titles, but the team was unable to win the NCAA title in any of those three seasons. Recent history may actually be in Florida State’s favor, as the last two NCAA team champions — Georgetown in 2011 and Oregon last year — finished as runners-up at Pre-Nationals. Up three spots to No. 6 is Michigan State following a fourth-place team showing at Wisconsin with 200 points. The Spartans did not record any top 20 finishers, led by junior Leah O’Connor in 22nd place, but they managed to be one of just five teams at the meet to get its top six finishers through the line within the meet’s top 90. Also encouraging for MSU was defending Big Ten champion Sara Kroll’s individual win in the "B" race, running unattached. No. 7 Butler is up 13 spots from the last poll following a third-place showing at Pre-Nationals that featured three top-30 finishers — one of only three teams to accomplish the feat in Terre Haute this season. No. 8 Iowa State was the other big mover into the top-10, jumping 20 spots from the previous poll after a fifth-place showing at Wisconsin. New Mexico is down two spots to No. 9 following a sixth-place team showing at Wisconsin, and Virginia rounds out the top 10, up six spots after finishing fourth at Pre-nationals. The Cavaliers placed seven runners within the top 107, a feat not matched by any other team in the meet. Dropping out of the top 10 were defending national champion No. 12 Oregon (down six spots), No. 13 Washington (down nine spots), and No. 17 San Francisco (down seven spots). Other teams moving down included No. 20 Stanford (down nine spots) and No. 24 Cornell (down nine spots). Outside the top 10 the biggest gainers were No. 15 Minnesota (up seven spots) and No. 22 Notre Dame (up eight spots). Minnesota had the tightest 1-5 pack at Wisconsin, with only 30 spots separating their top finisher (45th) from their fifth finisher (75th). Six teams joined the poll for the first time this season: No. 19 Syracuse, No. 21 Indiana, No. 25 Boise State, No. 26 Arizona State, No. 28 Wisconsin and No. 30 Mississippi. Both Boise State and Mississippi are nationally-ranked for the first time since USTFCCCA records began in 1995. Syracuse is ranked for the first time since week three of last season, while Wisconsin appears for the first time since week four last year. It has been since 2010 that Indiana (week seven) and Arizona State (preseason) have been ranked nationally. The NCAA Division I National Championships will be contested in Terre Haute, Ind., on November 23 and will be broadcast on NCAA.com.